Installation exhibit by Michelle Barczak, Ed Brown, Chris Erchick, Beili Liu, and Andrew Thompson. While once might be happenstance, and two coincidence, by the third time, a pattern starts to emerge. Such is the case with Detroit Industrial Projects, which continues in this third offering a solid string of exhibitions blending installation and sculptural elements made from common, non-traditional art making materials. Andrew Thompson knit “hot water cozies” out of plastic grocery and retail bags for the water pipes running through the industrial space’s ceiling. Obsessive work to say the least, and we might wonder where was he when we needed help making our high school floats? With this covering, Thompson transforms the hard and functional to something soft, perhaps even somewhat cozy, through the use of the formerly functional. 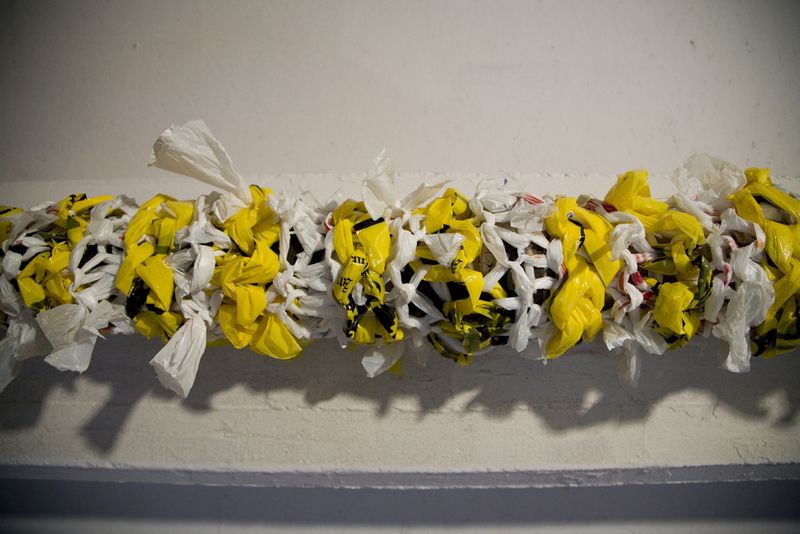 The plastic bags are a comment on consumerism, these single use, made to be thrown away items, now live on and become part of something to be looked at and valued, not to mention surprisingly attractive with color reminiscent of spumoni ice cream. 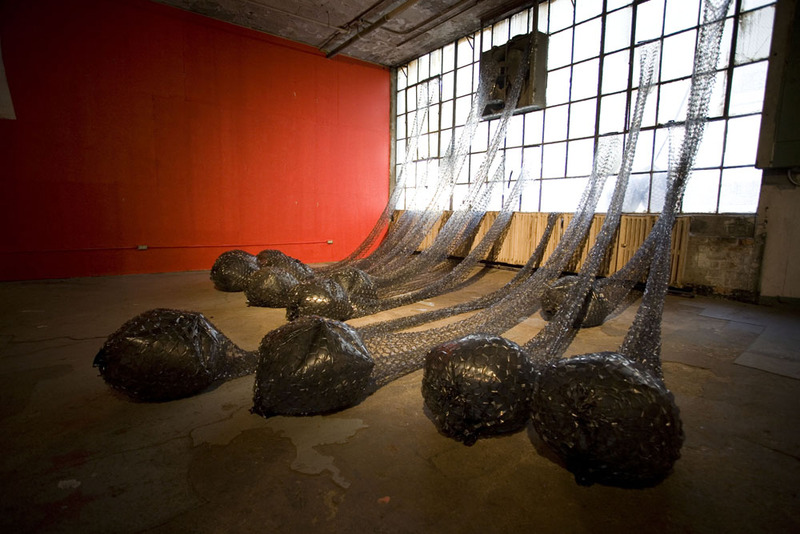 The cozies resonate curiously with Beili Liu’s independently conceived project, making use of large black plastic trash bags for her sprawling installation. By cutting countless purposeful slits in the bags she is able to stretch them out accordion-like to make long flowing limbs or perhaps tentacles, reaching into the space from the exterior windows like some giant octopus searching for sailors on a ship. At the ends of each of these appendages, she’s inserted a separate bag filled with air, giving the endings a bulbous form and the entire tube able to keep its volume. The stalks flow and are weightless like an evening gown, in fact, Liu’s left some stalks outside the windows to dance in the breeze. With such a common and simple material, Liu has created something of significant, almost living, presence. Chris Erchick’s sculpture, “Kid Icarus and the Cure for Cancer” is at once janky and sophisticated. He meticulously constructs in miniature a wooden observation tower and an abstraction of what he considers a car, complete with gold bling off its front end. The “car” pivots freely on a stand, floating like a land speeder from Star Wars and features a small light illuminating the ground below it. 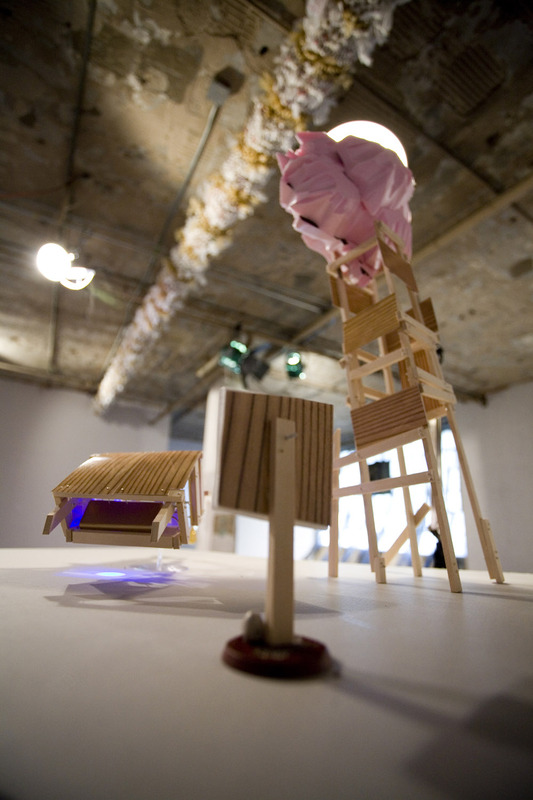 The tower terminates in a flattened sun-like mass of cut pink foam, lit by a swing arm lamp, all attached to the equally janky four-legged construction serving as a pedestal. The elements all work together, making sense intuitively. It’s almost poetic if meaning remains indiscernible. These are wonderfully built things, and Erchick’s construction skills seem to match his imagination. 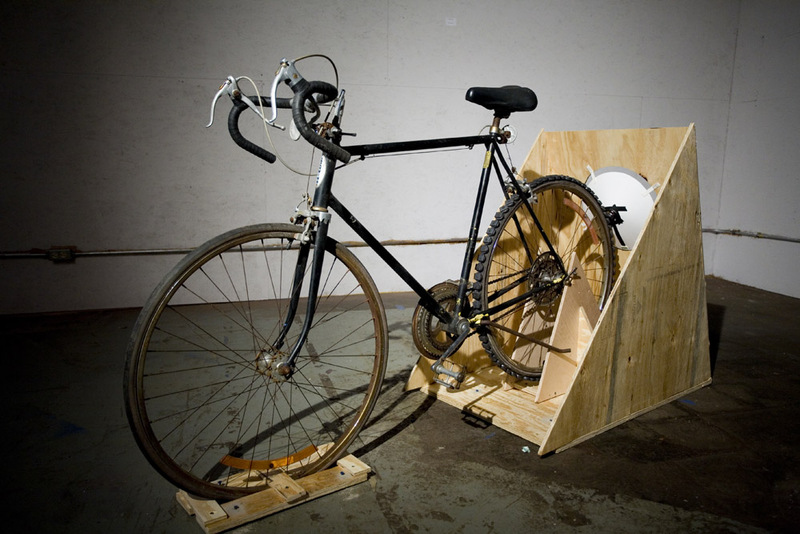 Ed Brown offers up a bike made stationary, and replaced the back tire with magnets. When spun by pedal power, they whip past a makeshift speaker generating sounds correlating to the r.p.m.s at which it’s all spun. It’s pretty clever and a lot of fun to play with, though the bike’s own noise-making ability after the pedaling is done tends to drown out the desired tune. 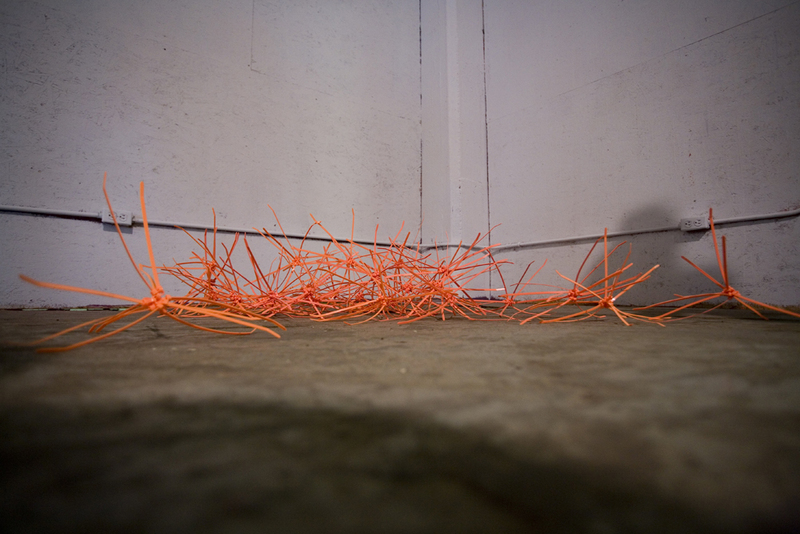 Rounding the show out are bright orange zip-tie stars by Michelle Barczak, which definitely fit in with the show, but lack some of the resolve of the rest. Perhaps about 10,000 of these things, to accompany the obsessiveness of Thompson would increase their presence.